This Full Energy cartoon won one of GoAnimate's semi regular 'Quickfire' contests with the theme of 'Summer Fun'. A quickfire contest is exactly as it sounds. You get given a theme and a few days to make an animation and the toon judged the best by GoAnimate Staff usually wins. There's no real prize except the winning entry is a guaranteed Staff pick and you get bragging rights for that particular competition. 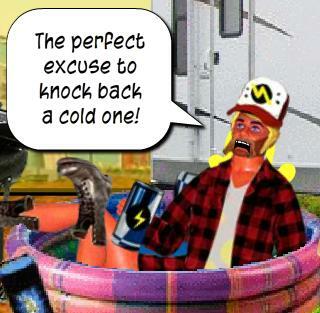 The Full Energy theme was a natural fit with it's existing trailer park background complete with fold out chairs and kiddie pool. The theme already had a BBQ too (or outdoor grill if you're not familiar with 'BBQ'). Quite a number of people have commented on my Full Energy cartoons saying I'm the best at coming up with ideas for the theme. I'm not sure what that says about me. Maybe I just have an eye for 'low rent' style characters since my Bat Storm series is also about 'low rent' characters. Although everything looks like it's 'off the shelf' GoAnimate props and backgrounds there is quite a bit of custom work in this one scene. 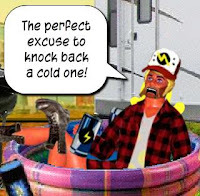 The original trailer park background wasn't hot enough for a real hot summer's day so I took a screen shot and did some image processing to make the scene more yellowish-orange. The original background also doesn't allow you to have people walk out from behind the caravan (as the girl does) or to have a character properly seated in the pool (like Dave is) so there are two additional mask layers added to make these things possible. The Dave character also has no action to make him sit in the pool the way he is. If you look real closely, just below Boss's right arm you can see part of a second Dave's hat (I just couldn't be bothered fixing the mask so that this wouldn't be seen - you probably didn't even notice it until just now anyway). The pretty girl's head is custom too and is one I created for an earlier Full Energy toon called The Ladies Man. Finally the smoke, and I think even the flame are custom props from the GoAnimate Community. I don't know who actually made them though? The punchlines are very much my style of humor. They're not jokes as such, they're just funny lines that flow naturally from the action. I think people relate better to that style of comedy because it's more like real life. You can kind of imagine real people in this kind of situation, bagging each other out as to who was the most impressive, even though the girl probably thought everyone looked like a tool.